A Japanese court has ruled that Tokyo should pay about 30.2 billion yen ($267 million) in damages to residents suffering from noise coming from the biggest US base on Okinawa, but rejected a call to suspend night and early morning flights. On Thursday, the Okinawa branch of the Naha District Court ordered the Japanese government to pay the compensation to residents near Kadena Air Base, which hosts the largest combat wing in the US Air Force. The base hosts some 22,000 US soldiers, family members, and Japanese employees in the towns of Kadena and Chatan and the city of Okinawa in Okinawa Prefecture, according to base data. According to presiding Judge Tetsuya Fujikura, the noise burden on locals has continued despite a 2009 ruling that called upon Japanese authorities to improve the situation. The damage has “caused mental pain, disturbance to sleep, and an increase in the risk of negative health effects from developing high blood pressure,” he said, according to Jiji Press, as cited by AFP. However, the court turned down a demand from the affected residents to ban nighttime and early morning flights at the airbase. “Although the impact of the noise had become a social problem as early as 1970s around the military base, the US and Japanese governments have not taken fundamental prevention measures until today and illegal damage has been aimlessly left unresolved,” the court said in the ruling, as cited by Kyodo news. Some 22,000 residents living near the base had asked for a monthly payment of 57,500 yen each for future damages and called for a flight ban between 7pm and 7am at the base. The plaintiffs complained of sleep disruptions and hearing disorders, claiming that they lived with noise at a value of 75 to 95 on the Weighted Equivalent Continuous Perceived Noise Level index (WECPNL). The average WECPNL index is 70-75, according to Japanese Ministry of Environment. 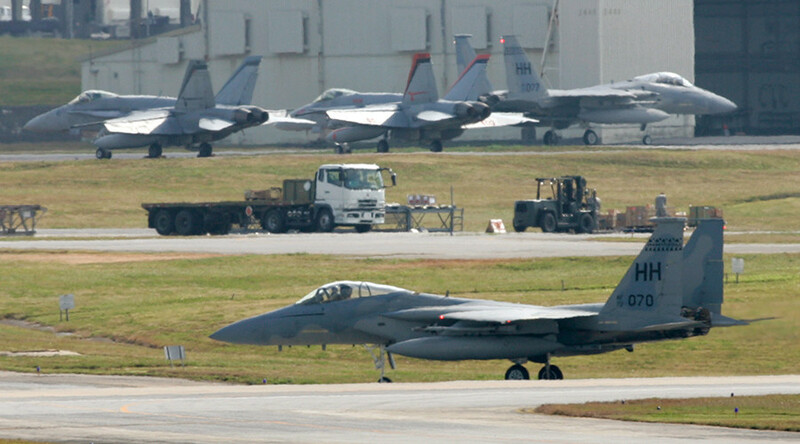 However, the court said that Japan “cannot restrict” flights at the Kadena base, as the facility belongs to the US. This is the third lawsuit brought against Kadena airbase, according to Kyodo data. The first, which was filed back in 1982, resulted in 1.37 yen billion payment. The plaintiffs in the second case, which was filed in 2000, received 5.63 billion yen in damages. The latest compensation is the biggest so far in the history of lawsuits brought against US bases in Japan. Tokyo earlier paid 8.2 billion yen to people claiming to suffer from noise at the Atsugi US Naval Air Facility in Kanagawa Prefecture.